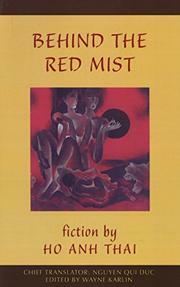 Behind The Red Mist ($13.95 paperback original; Sept.; 245 pp. ; 1-880684-54-3): A fine collection of ten stories, all published in the last two decades, by a talented writer who explores postwar life in his native Vietnam with a commanding mixture of brutal realism and symbolist fantasy. Thai’s primary subject is the contrast between naive patriotism and the embittered realism of later generations scarred by their country’s recent history of prolonged warfare. “The Chase,” “Leaving the Valley,” and the complex title novella all vigorously explore this theme, and are enriched by their juxtaposition with such unusual companion pieces as a wry homage to E.M. Forster (“The Indian”) and a mischievous satire on bureaucratic greed (“The Goat Meat Special”). A first-rate English-language debut.